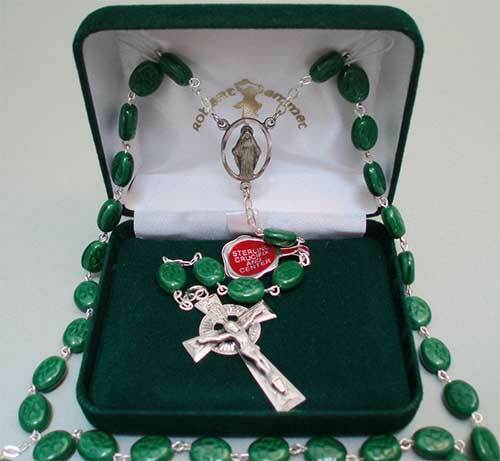 These Irish rosary beads are complete with a Celtic crucifix and Lady of Knock center that are cast in sterling silver. This Irish rosary features green beads with shamrocks that are made of pressed glass and it is 5 decade long. The Celtic crucifix measures 3/4" wide x 1 1/2" tall and it is enhanced with Trinity knots. 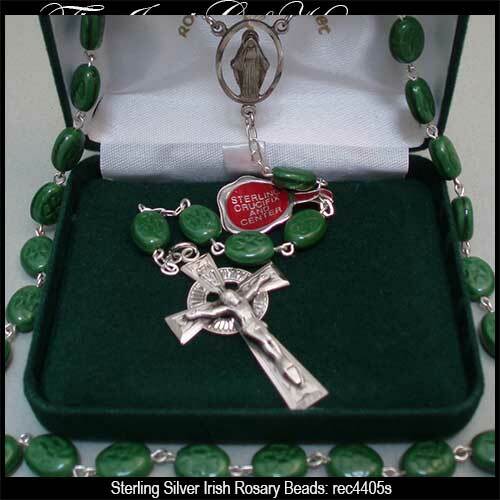 The sterling silver Irish rosary is made in the United States and it is gift boxed with shamrock, Celtic knot and Celtic cross history cards, complements of The Irish Gift House.